• Stamp a Whisper White piece of cardstock with the sentiment. Cut the sentiment out with the heart die. Adhere the Powder pink sheet to the DSP sheet and attach to card base front. • Attach Melon Mambo piece to the front top area. 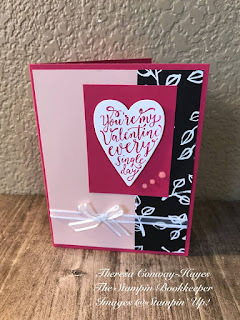 • Use Stampin Dimensionals to adhere the die cut heart onto the Melon Mambo piece. • Cut 2- six-inch pieces of ribbon. Wrap the first piece around layered papers and tape or adhere using some other adhesive. Take the second piece and tie into a small ribbon to attach with a glue dot.